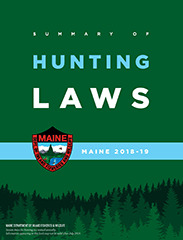 Hunters for the Hungry, is a cooperative program between The Department of Inland Fisheries and Wildlife and The Emergency Food Assistance Program (TEFAP) within The Department of Agriculture, Conservation and Forestry. This program provides a means for hunters to donate all or a portion of their hunt to a family in need. This program has been extremely beneficial to our citizens providing lean, high protein meats to food pantries, soup kitchens, and homeless shelters.